It's been a long time coming, but the final release of FeedDemon 3.0 is finally here. If you're using FeedDemon 2.x or a pre-release of FeedDemon 3.0, simply install the final release on top of the previous version. There's no need to uninstall first. 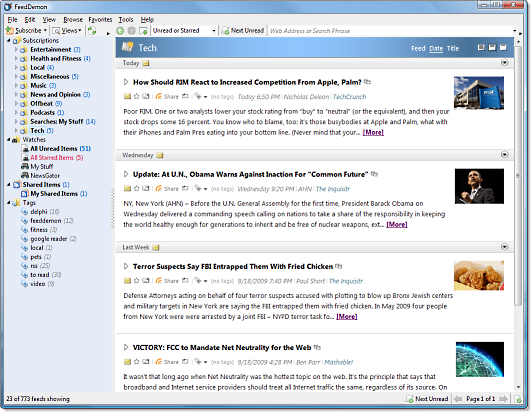 As most of you know, the biggest change in the new version is Google Reader synchronization, which replaces the now-defunct NewsGator synchronization that existed in previous releases. 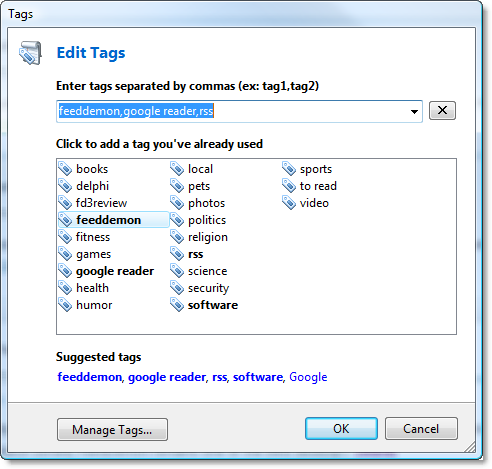 The first time you run FeedDemon 3.0, you'll be asked whether to convert your NewsGator subscriptions to Google Reader. The conversion may take a few minutes, but I think you'll like how much faster synchronization with Google Reader is once the conversion completes. If you tried an older pre-release of FeedDemon 3.0 and found sync to be slow, then you really should get the final release. Sync is much faster now. With Google Reader synchronization comes the addition of some handy new features, most notably tagging and really simple sharing. FeedDemon 3.0 makes adding an article to your Google Reader shared items as simple as possible – a single click is all it takes. Plus, you can drag-and-drop hyperlinks and browser tabs into your shared items, so you can share almost anything you find on the web. You can also easily add a comment to your shared item. In addition to Google Reader synchronization, FeedDemon 3.0 greatly improves the way Twitter feeds are handled. Author names, hashtags and @replies are automatically hyperlinked, and mousing over a short URL shows you where it really goes. You can also subscribe to password-protected Twitter feeds in FeedDemon, which is something you can't do in web-based RSS readers. But my favorite new feature has to be the faster, sleeker, more informative user-interface. FeedDemon 3.0's new subscription home shows an overview of your feeds, and highlights popular articles and YouTube videos in the feeds you're subscribed to. And FeedDemon's popular newspaper view has been simplified, so you can quickly see what you want to read without an overload of toolbuttons getting in the way. 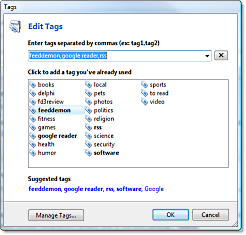 One of the features in FeedDemon 3.0 I've seen highlighted in several blog posts (including this really well-done one by Amit Agarwal) is the ability to easily create keyword search feeds, which has actually existed for quite a while. 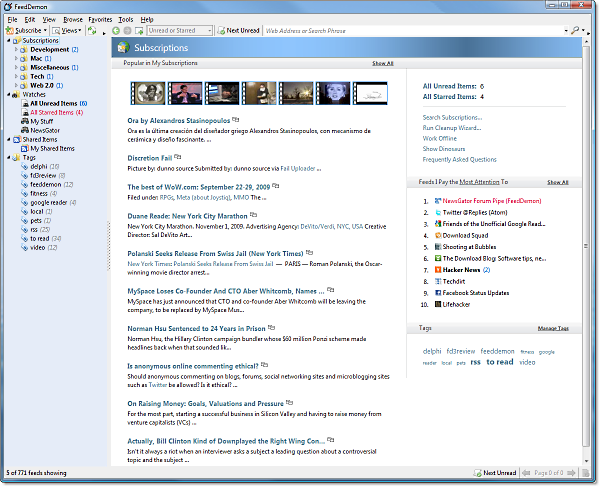 Just enter a keyword and choose a search engine (Bing, Google, Techmeme, Twitter, YouTube, etc. 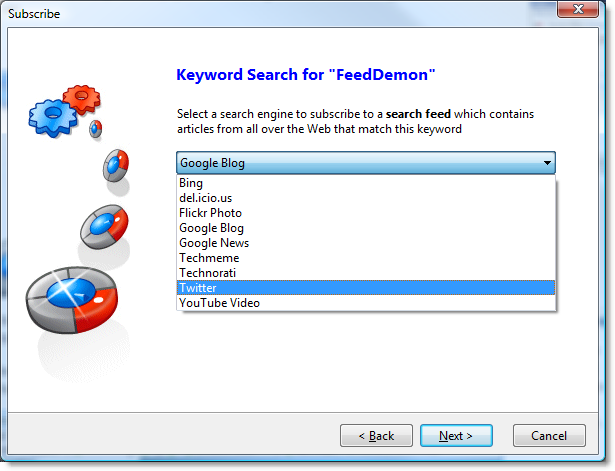 ), and FeedDemon will subscribe you to a feed containing the latest search results for that keyword. There's a whole lot more I could talk about (such as FeedDemon 3.0's new SQLite backend, which makes everything much faster than before), but I figure if you made it this far, you've heard enough :) If you really want to know everything that's new, check the release notes for a detailed list of changes. Suffice to say, I consider FeedDemon 3.0 to be the most significant release since the very first version, and I hope you're as pleased with it as I am. Looks like I'm going for a personal record in the number of pre-releases before the final build, because FeedDemon 3.0.0.39 Pre-Release is now available. If you're using an earlier FeedDemon 3.0 pre-release, just stop by the FeedDemon Beta Site to get v3.0.0.39. As always, if you run into any problems with this build, please let me know by posting in the FeedDemon 3.0 Beta Forum, and be sure to include the build number (3.0.0.39) in your subject line. FeedDemon 3.0.0.32 Pre-Release is now available. If you're using an earlier FeedDemon 3.0 pre-release, just stop by the FeedDemon Beta Site to get v3.0.0.32. As always, if you run into any problems with this build, please let me know by posting in the FeedDemon 3.0 Beta Forum, and be sure to include the build number (3.0.0.32) in your subject line. BTW, if you haven't used a recent build, you may be surprised to discover that you can now purchase a serial number to get rid of the ads. For the record, we never planned to offer a paid ad-free version – we were blown away when so many people asked for one. Because of the demand for a paid ad-free version, we've partnered with eSellerate to make it possible to purchase a serial number that will turn off the ads. If you don't mind the ads, no worries – FeedDemon will remain free (and we won't make the ads more annoying later on, just to "force" you to pay). But if you really hate the ads, there's now a way to turn them off.